You may recall my post about treating gestational diabetes with food and exercise. I talked about how you can use food, such as working with a meal plan, to make your compliance better. And with exercise you can lower your blood sugar as a way to decrease the highs that come with meals. When you consider treating gestational diabetes, you usually ask about medications as well. You need to keep your blood sugar under control – in the range of less than 95 mg/dl before meals, and <140 mg/dl at 1 hour after starting your meal. That is the goal and that is what you need to understand to know what your doctor is going to do when treating gestational diabetes. If diet and exercise are not enough, you will need to consider with your doctor what medications you should take to control your blood sugars. Some information suggests that you should allow about 2 weeks for the diet and exercise to control your gestational diabetes prior to treating gestational diabetes with insulin or oral medication. Depending on the amount of control that your diet and body can manage, you may be able to make it through the entire pregnancy without medication. That is a fine goal to have. Some women do just fine, and others find it is almost impossible to manage. When considering treating gestational diabetes, think of it this way. It’s only for the last 14-16 weeks of pregnancy. You can do this and you should do what is necessary to manage your blood sugars so your baby will be healthy. And I know that is what you are doing when you are thinking about whether or not you should take medication because it may have side effects. Insulin is hands down the safest medication that you can consider. It must be injected – usually several times per day – and a lot of women don’t like that. It is a very fast acting medication and tends to bring the blood sugars down quickly depending on the amount you use and how much carbohydrate you have eaten. It’s usually considered in women when their fasting blood glucose is over 95 mg/dl or their 1 hour values are over 140 mg/dl. No magic amount of insulin has been found, every woman is individual and considered by her reaction to the medicine. Insulin is safe because it does not cross the placenta. In treating gestational diabetes, most women are given insulin either as a primary therapy if diet does not work, or as a secondary therapy after trying an oral medication. 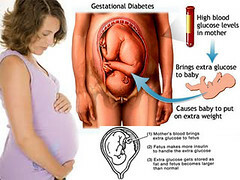 Overall, insulin has been used the longest in pregnancy and is the best choice. The main oral agent recommended by physicians is glyburide, but there is additional risk with oral agents because they cross the placenta and can affect the baby. Glyburide has not been shown to be safe and effective, all oral agents have a pregnancy category of B at a minimum. Other medications that may be used are metformin and glucophage. Metformin works by decreasing your body’s production of glucose and improves your body’s ability to use insulin that it already makes. Metformin should not be taken by women who have kidney problems or have had kidney problems in the past because it does affect the kidneys. Glyburide works to stimulate insulin release, and increase insulin sensitivity in your body. Allowing your body to use the insulin it has better. Part of the issue with gestational diabetes is that your hormones that are being produced by the placenta have started to affect your body’s ability to handle insulin. You may need more insulin than you like at meals and checking your blood sugar will continue to happen throughout the pregnancy. You will need a gestational diabetes meal plan. A few studies have shown that glyburide and insulin show similar outcomes while treating gestational diabetes. You have to make the choice with your doctor about how you will treat your gestational diabetes because every woman is different. Medication is not going to allow you to stop doing any of the other parts of this process to make it through your pregnancy and attain a healthy baby. You will have to do all of the things (if required) to get the best outcome. Treating gestational diabetes is not easy and involves a mutli-level approach, starting with food and exercise and adding medication as needed. You cannot take Metformin while prngnaet!!! You can try to keep the glucose levels down with just food planning and exercise, but life is so much simpler with insulin to help.What the doctor is aiming at is a very healthy baby and mother when the pregnancy is over! !Ok, now change your whole lifestyle!! Because if you are GD you are at very much higher risk of developing full type 2 diabetes later in life.Think of me as your Nana telling you how to live your life! !Start with the low carb lifestyle, Atkins phase 2, South Beach phase 2, Zone Diet, all will assist you to become a very healthy good mother. These food plans are very good to instill in your daughters also. They will be at a much higher risk for diabetes as well.Come on!! Pricking your fingers every day sometimes hurts, but taking an injection doesn’t hurt that much! You will be able to have more variety in food planning than if you flat out refuse to consider the insulin.Come through this pregnancy healthy and happy and have a healthy baby!! That is the name of the game! If it takes insulin, well it takes insulin.Good luck, little one!! !